It seems that the old adage “necessity is the mother of invention” continues to ring true even in the 21st century, especially for ‘mompreneur’ Karen Byrd. The California-based business woman is the founder/creator of NATURAL GIRLS UNITED, a doll company that takes straight-haired dolls of different skin tones and gives them customized, ethnic textured hairstyles and clothing. Less than 10 years ago, Natural Girls United was created while Karen was still working in corporate America. Today, she’s now sending her beautiful dolls to customers throughout the world. One third of her customers are from the United Kingdom. Other customers are ordering from Africa, Brazil, Netherlands, Australia, a few from China, and of course, the USA. “The idea for these dolls really started in my childhood. I had dolls that didn’t look like me or anyone around me, “recalls Karen. “The hair wasn’t like mine, nor the eye colors. Even when the black dolls were released, they still had features of the Caucasian dolls. It was confusing for a child. 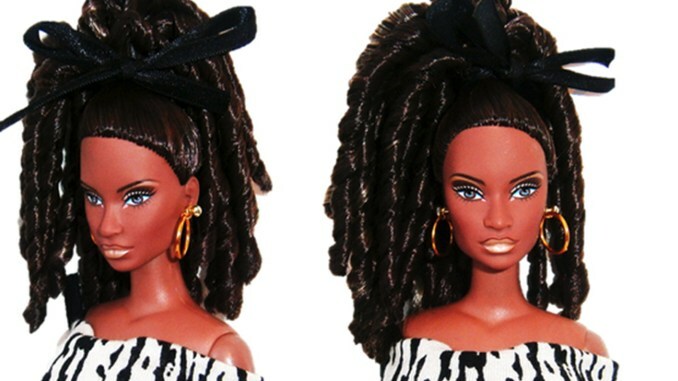 As an adult, as I was raising my daughters, I still couldn’t find any dolls that really did have our African American hair features. So, after half a lifetime there still wasn’t anything out here, as far as real ethnic looking dolls were concerned.” Karen decided to find an answer to this problem. Karen now buys the dolls retail at full price. She’s very hush-hush about what she uses to get change the straight doll hair to become more ‘texturally ethnic.” Each style can take from three hours to three days to complete. The dolls have custom clothing attire that’s fashionable and fun to complement the hairstyles. Many of the clothing outfits she uses are often handmade. Several of the dolls have long eyelashes, painted nails, with a new handmade dress and heels. Chunky Locs, The Coils, Soft Locs, Spiral Curls, are just a few of the 32 different hairstyles customers can choose from. Other new styles are always being created by this busy and creative business minded mom.